Answers. The solution to the problems. All to play on our servers. Begin advertising and are registered in the ratings. Support the project by voting for it! We are glad to inform you that our server is Diablo 2 available! Connects you will find in the downloads section. How to cope with possible errors, in the FAQ section. You like classic games? Welcome! 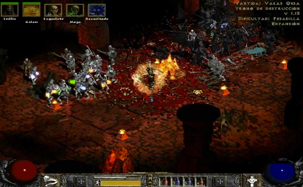 RPG Diablo 2 and/or any images associated with Diablo 2, are trademarks and property of Blizzard. All other copyrights and/or trademarks are the property of their respective owners.